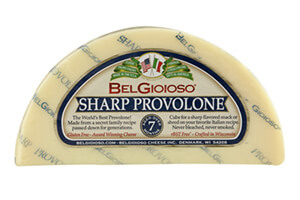 Our Sharp Provolone is made here in the US, in Wisconsin, by BelGioioso and is aged for 7 months to develop a sharp flavor and packed as small 5 oz. half moon slices. A multiple Award Winner, including Best In Class in both the American and World Competitions, our Sharp Provolone is an excellent, award winning introduction to an Italian classic. Southern Italy is the traditional home of Provolone; a cow's milk cheese that is very much a staple in the Italian cuisine. Provolone is available in varies stages of aging, made from raw or pasteurized milk, shapes as a sausage, pear or cone and there are also smoked varieties. Provolone is one of the great Italian gourmet cheeses that is found in every Italian restaurant and kitchen and goes well just about anywhere cheese can go. Make it a part of your family tradition.